Here is a variety of chutney which I learned from my mom. For this chutney, don't use the green chillies which r too hot. Use more of green chillies which are less hot to give a nice aroma to the chutney. 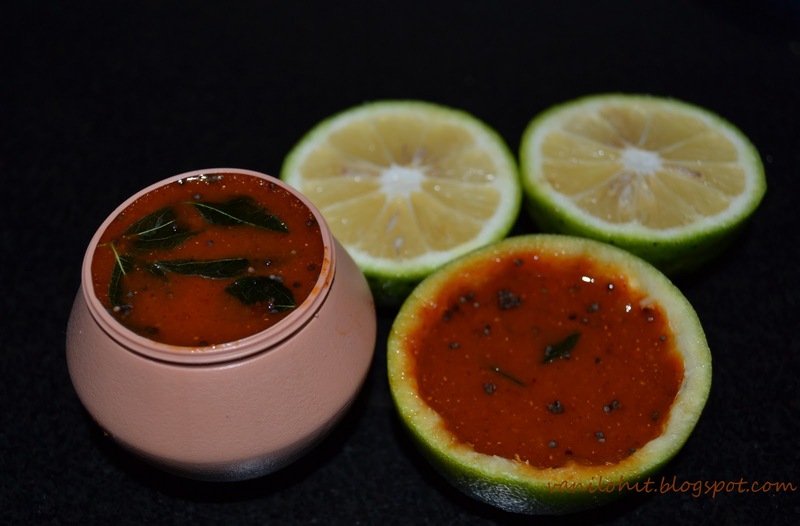 This chutney goes well with all varieties of dosa, idli and chapathi. Heat oil in a small wok. Add urad dal, mustard seeds and sesame seeds. Once it is nicely roasted and starts spluttering, add chopped green chillies. Saute them for 2 - 3 minutes and remove from the flame. Grind this seasoning along with grated coconut into a coarse paste. Add salt to taste and do the seasoning with mustard seeds. I always love doing new experiments in kitchen. Especially for breakfast, I will keep trying new varieties frequently. Mom knows my liking towards cooking. Normally, when she goes through an interesting recipe, she will note it down for me! Happy to say that, she has added lot of recipes to my collection :) Also, she will share lot of tips with us for improving the taste of recipes. 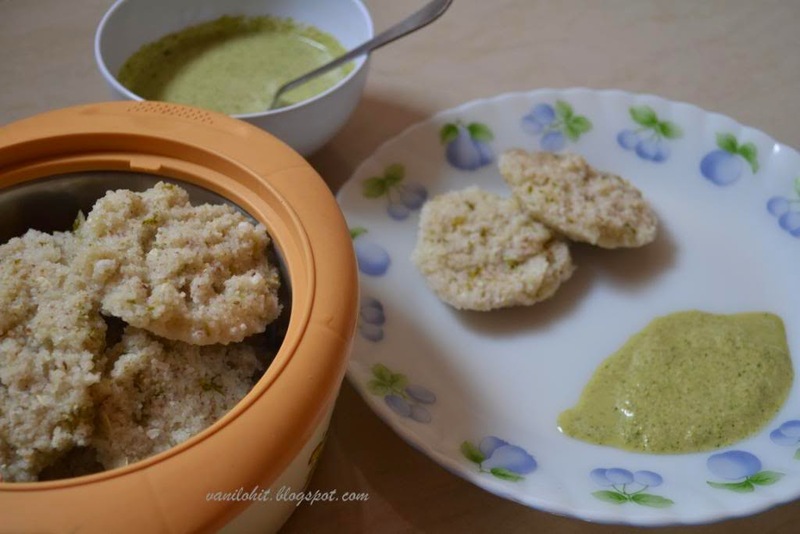 Here is a recipe from my mom's collection which suits for your breakfast. 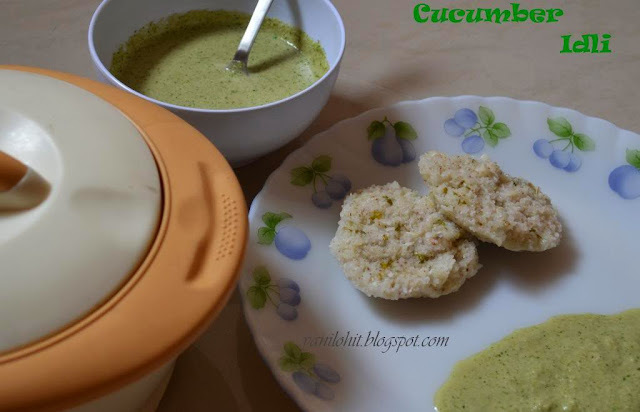 This variety of idli is prepared using cucumber and rice as the main ingredients. It's a stomach filling idli since we use the rice. 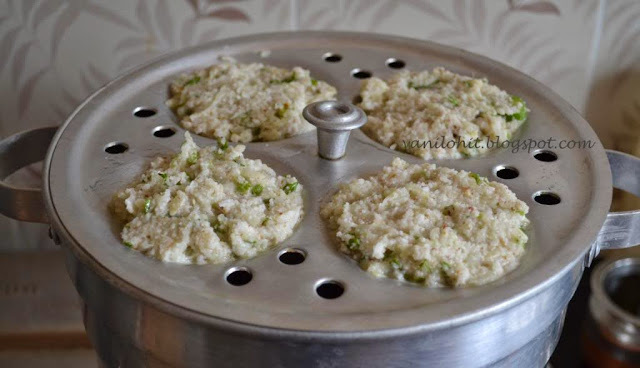 Fermentation is not required for this idli, so you can start working on it just an hour before breakfast! Wash the rice and drain all the water. Spread it on a cotton cloth for 10 - 15 minutes for drying. Then, make a coarse powder same as Idli Rava from the rice. This can be done previous night itself to save the time! Dry roast fenugreek seeds, cumin seeds and carom seeds and make a fine powder. Only half of this powder is sufficient for preparing idli with the above measurement. Preserve the remaining powder for using next time. Peel and grate the cucumber. 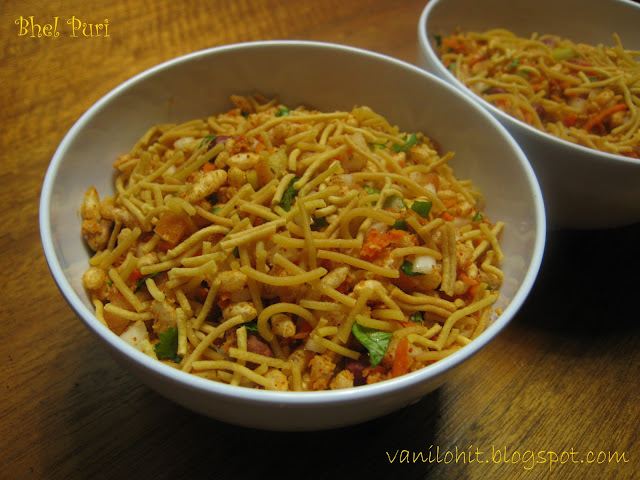 Keep the crushed ginger and chopped green chilli ready. Take the grated cucumber in a mixing bowl, add the coarsely powdered rice, grated coconut, chopped green chilli, crushed ginger, chopped coriander leaves, powdered spices and salt to taste. Mix it well. Wash the idli plates and apply little oil. Fill the roundels with idli batter and cook them for about 25 - 30 minutes. It will take exactly 25 minutes in my Idli Kadai. 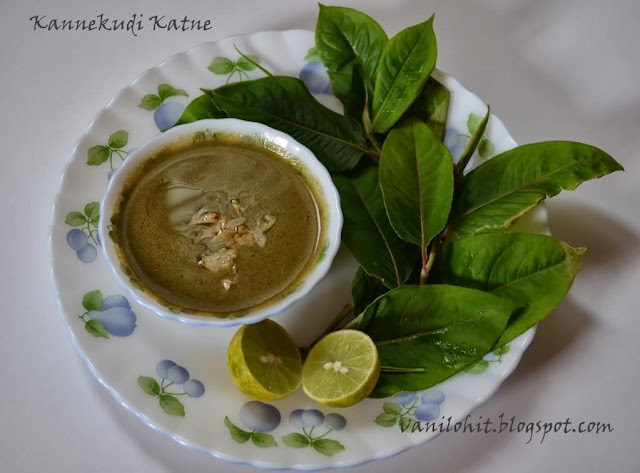 Kannekudi or Soralekudi is a plant variety of Malnad region, the leaves of which will be used for cooking. It will grow like a bush. I don't know its scientific name. People use it for cooking mostly during the rainy season. It has good health values..especially when we get cold, fever, etc, it is good to have Katne with rice. 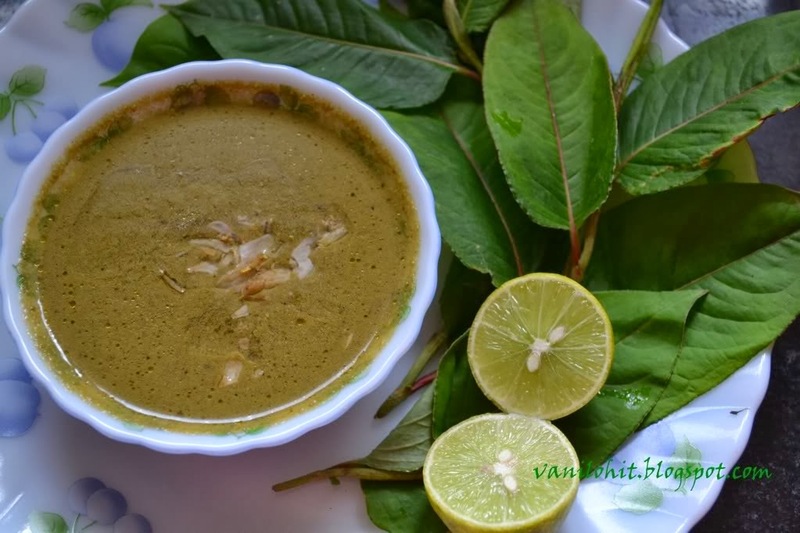 If you can get Kannekudi, don't miss out preparing this healthy and tasty dish. The same way, Katne can be prepared using Spinach (Palak) leaves also! Wash the Kannekudi leaves thoroughly in water. Remove the leaf stalks and leaf veins which are hard. Heat 2 spoons of oil in a pan and roast the pepper corns till you hear the crackling sound. Add the cumin seeds and saute for a while. Then, add the Kannekudi leaves and saute for 2 - 3 minutes. Switch off the flame once the leaves change their color. Grind these ingredients along with grated coconut into a fine paste. Add 3 - 4 cups of water to adjust the consistency. Add salt to taste and boil it for 5 minutes. Switch off the flame and add the lime squeeze. Do the seasoning with mustard seeds and crushed garlic before serving. 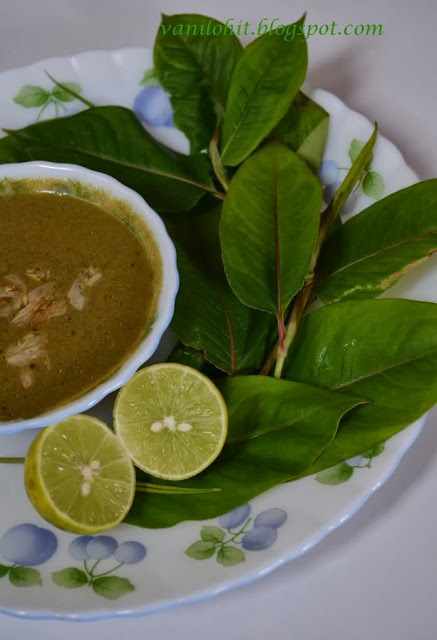 This healthy and tasty Katne is a good combination with rice especially during winter and rainy days. For this recipe, amchur can be used instead of lime squeeze. But adding of lime will give a nice aroma to Katne. Coming to the recipe, Saate is a special sweet variety which you can find in North Kanara. It looks bit similar to Badusha, but the taste will be different. Badusha will have a smooth texture whereas Saate will be kind of crispy. You will find this sweet dish in almost all the sweet stalls in North Kanara, but nowhere else I have seen this sweet variety in Karnataka.I checked for Saate recipe in the net, but didn't get any postings still!! 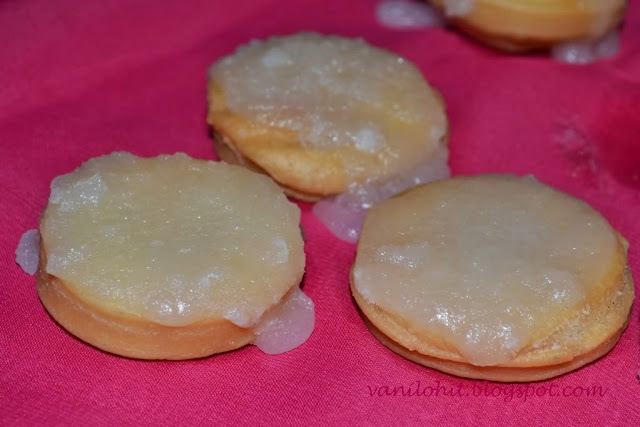 So, I am very glad to post this recipe.. may be I am the first person to post this ;) I learned this recipe from one of my cousins, who has expert hands for preparing these goodies.. Mix all purp flour, salt and ghee / dalda nicely. 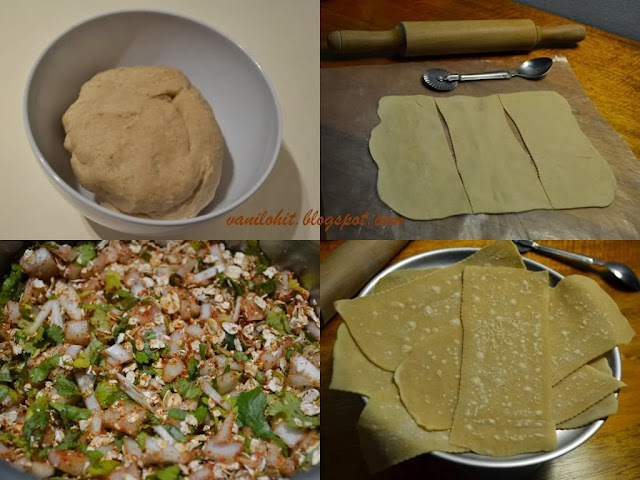 To this, Add water little by little and prepare a non - sticky dough like chapathi dough. Close it with a lid and allow it rest for 10 minutes. Divide the dough into 2 equal parts (this is just for convenience; you can use the whole quantity at once). Roll the dough like a big chapathi. Fold it twice and you will get a triangle shape. 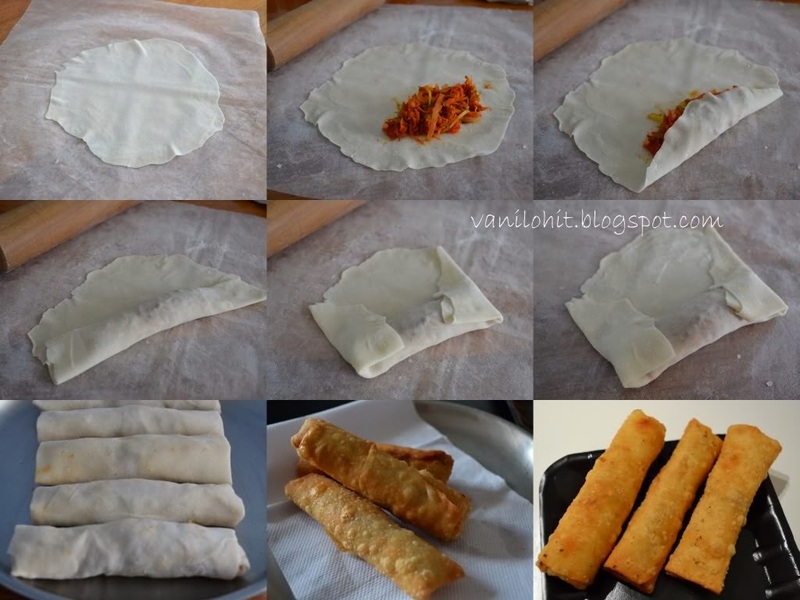 Roll it again like chapathi and fold it. Repeat this step at-least 15 - 16 times to get lot of layers. Finally, roll it into 1 inch thick chapathi and cut into circle or any other shapes. 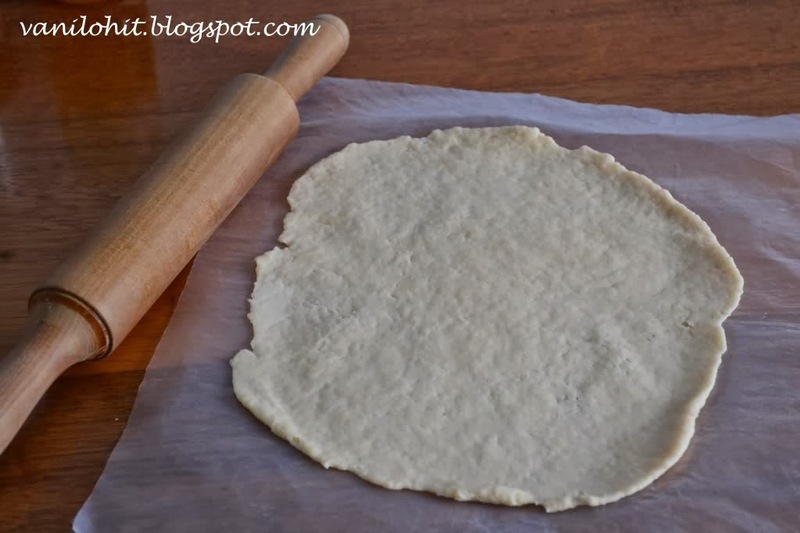 Combine the remaining dough, roll it 15 - 16 times and cut them. Prick the circles with a fork to avoid puffing up. Also, it helps to cook the inner layers of saate nicely. Add very little water to the sugar just to liquidize it and bring to boil. Prepare a thick sugar syrup. Consistency should be such that, if it becomes cool, it should crystallize. Heat oil in a heavy bottom pan. Deep fry the Saate on low or medium flame for around 20 minutes or until it becomes crispy. Transfer the deep fried Saate onto a tissue paper to absorb the excess oil. Once Saate becomes cool, arrange them on a nylon cloth. Heat the sugar syrup and liquidize it. Pour around 3 spoons of sugar syrup on the top of each Saate and spread it little-bit. Once the sugar syrup is settled and crystallized, its the time to take out the Saate from the cloth. Enjoy the Saate with your family and store the remaining in an airtight container. It will last upto a week if preserved properly. Sending it to the Event Love Lock With Sweets @ Sweet Karam Kapi. It's a well known sweet prepared during festivals in India. It tastes very similar to jilebi. I thought of this recipe to welcome a new member in our family. It's my first experiment. Even if I do not guarantee you about the shape, taste is guaranteed! Soak black gram for 5-6 hours and keep in the refrigerator for one hour. This is to make sure that the batter should not get warmed while grinding. Mix together a cup of sugar and a cup of water and boil to make a syrup of one thread consistency. Now add lemon juice and turn off the gas and keep it aside covered. Take out the black gram from the refrigerator and filter it. Grind the gram to get a batter soft like butter by adding very little water. The batter should be thicker than dosa batter. Keep in mind that the batter should not get even warm. Add a pinch of food color if you want. I added a pinch of turmeric here. Make a round hole in a zip lock cover with the help of hot nail. Fill the cover with the batter and lock the cover. Test the cover by pressing it on a plate whether the batter is coming out properly. Heat the oil in a pan on medium heat and put the batter in jangir shape in it. Fry until crispy. Put these jangirs in sugar syrup for 2 minutes. 8. Take out the jangirs and keep them on a plate and later transfer them to a storage container. Jangir will be tastier if you eat after 2-3 hours. Otherwise it might have black gram smell. Onion Samosa is a famous snack of Hyderabad. I heard about this samosa from some of my friends and tried it at home. It was so good and tasty n we liked it a lot. It will have a crispy outer layer and will be smooth from inside. For learning this recipe, first thing I did is I checked the Vah chef video and followed the same procedures. Later, wanted to go for a healthier version. I tried my own variations in the original recipe and prepared Oats Samosa! As all of us know, oats is low fat healthy food and many people prefer having oats for their breakfast to reduce the fat. These samosas can be preserved for 1 - 2 days and are perfect for evening snacks. Mix wheat flour, all purpose flour and salt in a mixing bowl. Add 2 tbsp of oil and mix well. 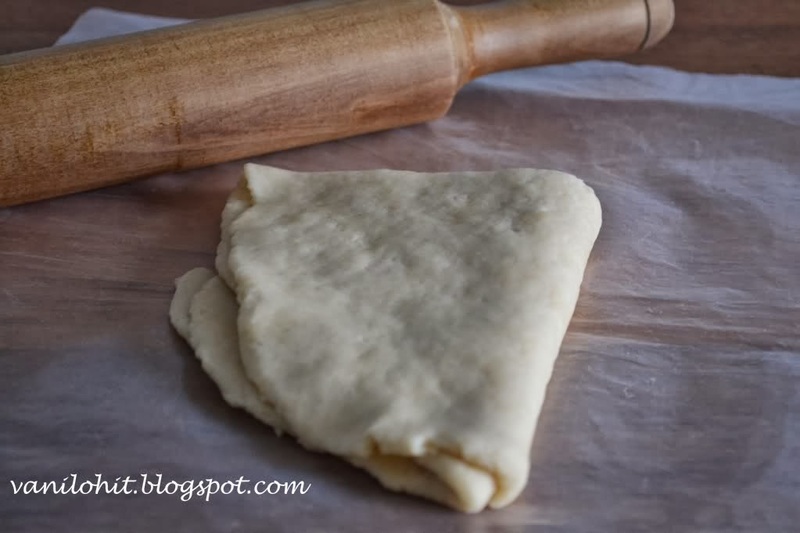 To this, add water little by little and prepare a smooth, non - sticky dough. Close the lid and let it rest for 15 - 20 minutes. For stuffing, mix all the ingredients mentioned above and keep aside. Check and adjust the taste according to your preference. 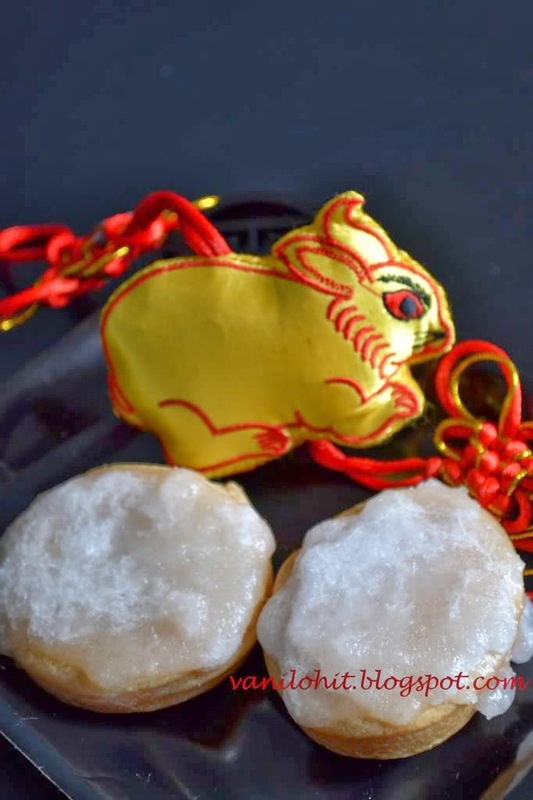 Prepare lemon size balls from the dough and roll them into thin circles. Use enough dry flour for dusting. Cut the rolled circle into rectangles of around 15 cm length and 7 cm width. Heat the dosa pan / skillet and put the rectangle sheets on it for a while. Once you see small bubbles on the sheet, just take them out. Take around 3 tbsp of all purpose flour / maida, add little water and prepare a thick paste. Prepare small cones from the sheets using the maida paste. Put around 2 tbsp of stuffing inside the cone and seal it firmly using the maida paste. Heat oil in a heavy bottom pan and deep fry the samosas on medium flame till they are crispy. Serve hot with sauce or ketchup. Or, simply you can eat the samosa as it is! To make the samosa more crispy and nicely colored, deep fry them twice. 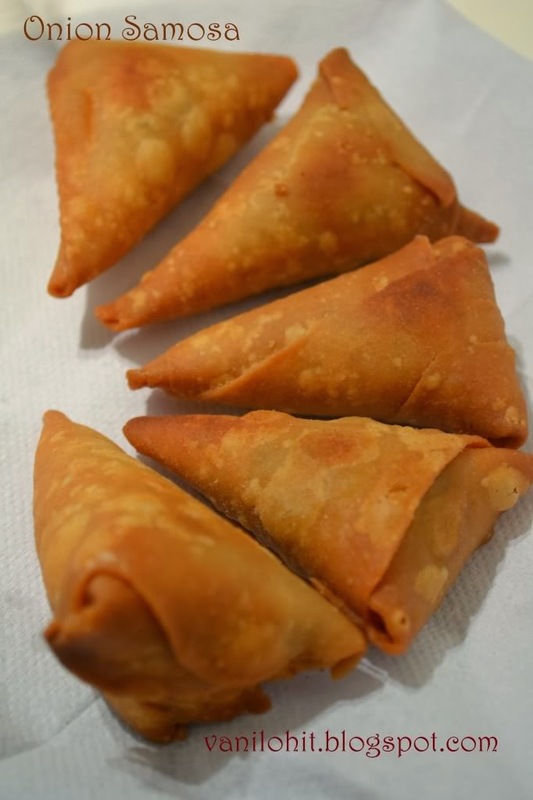 But samosa will absorb more oil if you deep fry twice. This is my entry to the Event Fast Food, Not Fat Food, # 7 hosted by Priya of Now Serving. 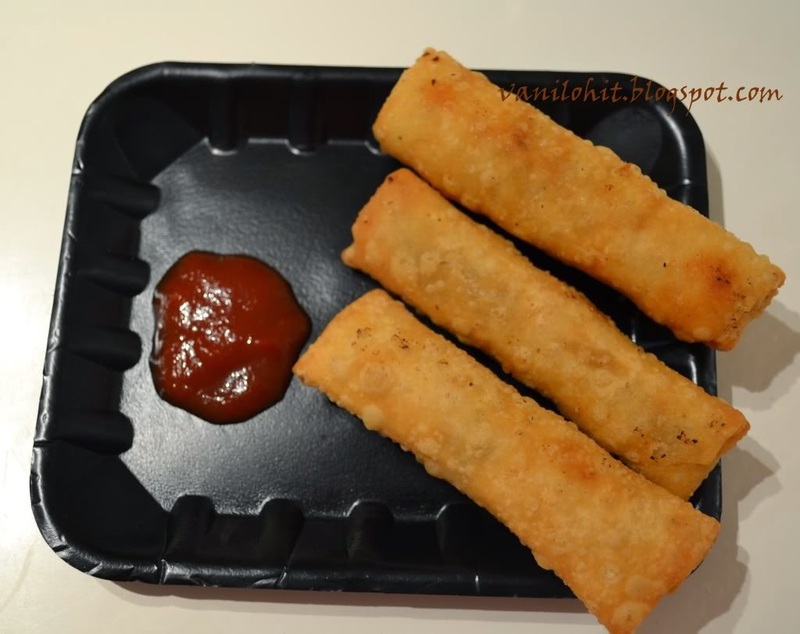 Spring roll is a kind of Chinese appetizer which will be perfect for evening snacks. It will have a nice crispy layer from outside and a smooth and spicy stuffing inside. 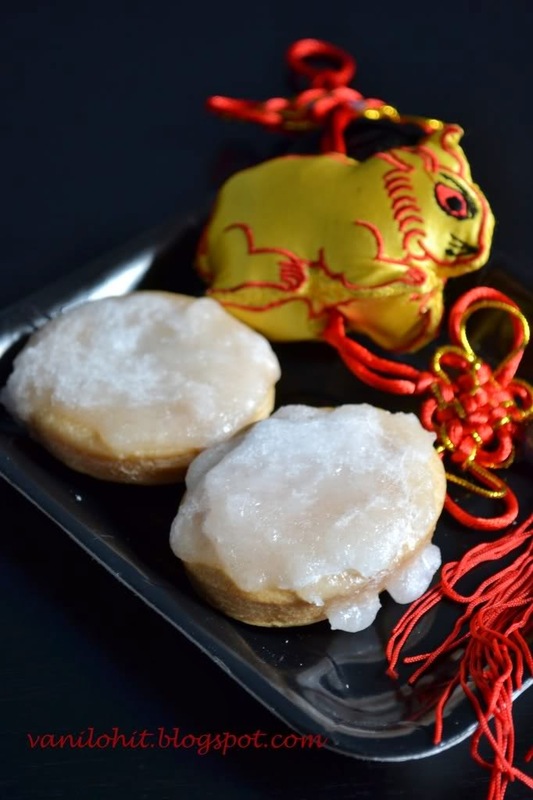 The name 'Spring Roll' is because of Chinese people who eat this dish during Spring festival. Spring roll sheets will be available in supermarkets and I used to buy the same earlier. Then, I tried preparing these sheets at home. Preparing the sheets at home is bit time consuming, but if you can't get them from the shop, definitely you can try preparing the sheets at home. Mix all purpose and salt in a mixing bowl. Add water little by little and prepare slightly stiff, non sticky dough. Knead the dough well, close the lid and let it rest for 10 minutes. Divide the dough into 8 equal parts and prepare the dough balls. 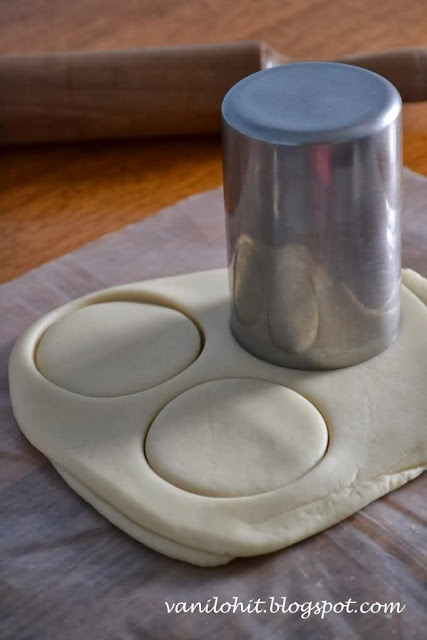 Roll them into very thin sheets using the rolling pin. Use the dry flour generously while rolling. Squeeze off excess water from the grated vegetables. Heat 2 - 3 spoons of oil in a frying pan. Add sliced onion once the oil becomes hot. Fry the onion for 2 - 3 minutes and add grated carrot, capsicum and salt to taste. Fry the vegetables for 5 - 6 minutes or until they become slightly crispy. Then, add soya sauce, tomato sauce and red chilli powder. Saute them for 2 - 3 minutes and switch off the flame. Less the water content, it will be better. Take around 1 spoon of all purpose flour / maida and prepare a thick paste using water. Take a spring roll sheet and pour around 2 table spoons of stuffing on one edge. Roll the sheet upto half by keeping the stuffing inside. Fold both the edges of the rolled portion into inside and press it gently. Then, apply the maida paste to the edges and roll the sheet fully. Fix the edges properly so that stuffing won't com out. Heat oil in a frying pan and deep fry the spring rolls on medium heat. Once they are 3/4th done, take them out and allow to cool for few minutes. Then, put them in hot oil again and fry until golden brown. Deep frying twice will make them nicely crispy and will give a nice golden brown color. Transfer the spring rolls onto a tissue paper to absorb excess oil. 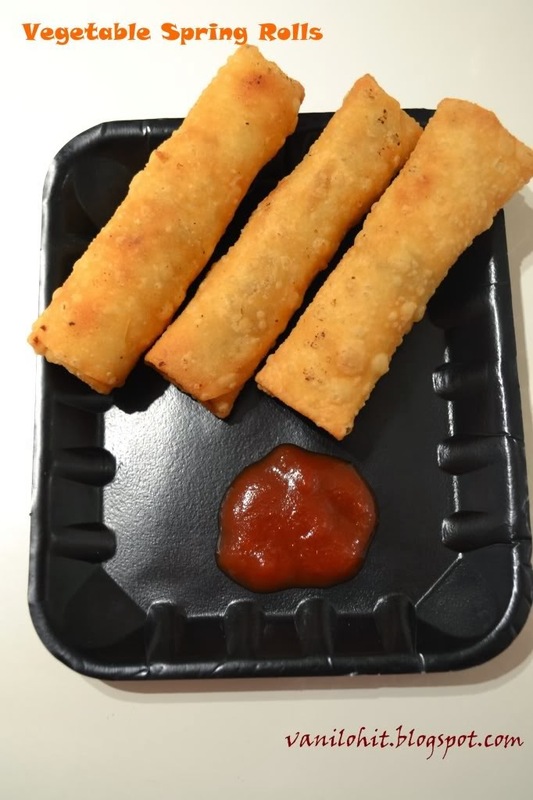 Serve the vegetable spring rolls with tomato sauce. Sending this over to the event Christmas Delicacy hosted by Julie. Sending it to Food of the Month Contest at Food Corner. Hi!! It was more than a week since I did the last posting. Due to our relocation to India, I was not able to update the blog regularly. Things are coming to a line now and I am back to my kitchen! We had been to our native last week. It was a nice time for us since we met parents and all the relatives after long time. My Aunt suggested me some authentic Havyaka recipes which I can try and share with you in the days to come. Take out the peel and cut the Kanchikaayi into two halves. 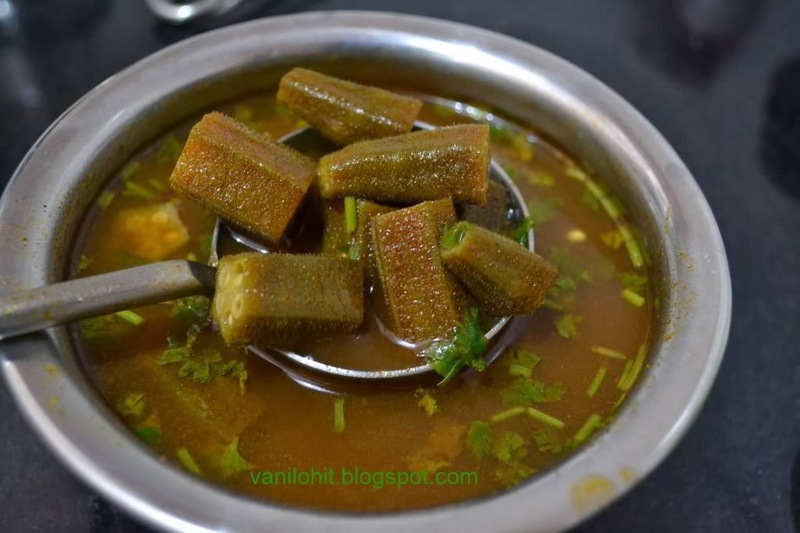 Take a spoon full of salt in a bowl and squeeze out the Kanchikaayi juice into it. Adding of salt will prevent the juice from becoming bitter. Heat around 1 spoon of oil in a small pan and roast the cloves, red chillies, mustard seeds and coriander seeds until you get a nice aroma. Grind the roasted ingredients along with grated coconut into a fine paste. While grinding, use the Kanchikaayi squeeze instead of water. Add around 1 1/2 cup to 2 cups of water to make the Appehuli little watery. Add salt and jaggery and adjust the taste. Boil the Appehuli for 5 minutes and do the seasoning with mustard seeds, asafoetida and curry leaves. 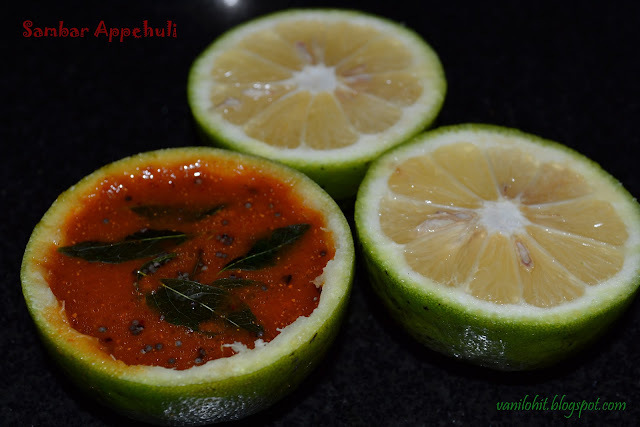 This tangy, spicy and sweetish appehuli goes well with rice. This kind of appehuli can be prepared using lime also. Wash the okras cleanly and rub with a towel. Cut the okra into medium size pieces. Soak the tamarind in water for about 15 - 20 minutes and take out the pulp. If you have the store bought pulp, you can use it directly. Heat 3 - 4 spoons of oil in a heavy bottom pan, add chana dal, mustard seeds, asafoetida, turmeric and curry leaves. Add the okra pieces and saute for 2 - 3 minutes. 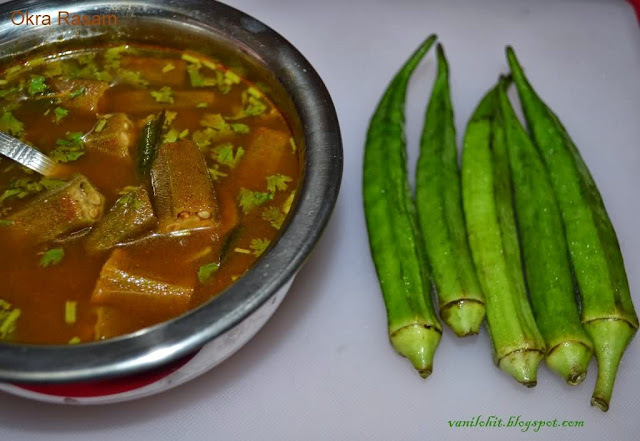 Mix the sambar powder with 1/4 cup water and add it to the okra mixture. Add salt, tamarind pulp and jaggery / sugar according to taste. Add around 3 cups of water and chopped coriander leaves to the rasam and boil it for 4 - 5 minutes. Serve it hot with rice. One nice idea to thicken the rasam is to add the rice flour. Take 1 spoon full of rice flour, dilute it in water and mix it with boiling rasam. Also, it will help to reduce the spiciness of any kind of sambar or rasam. 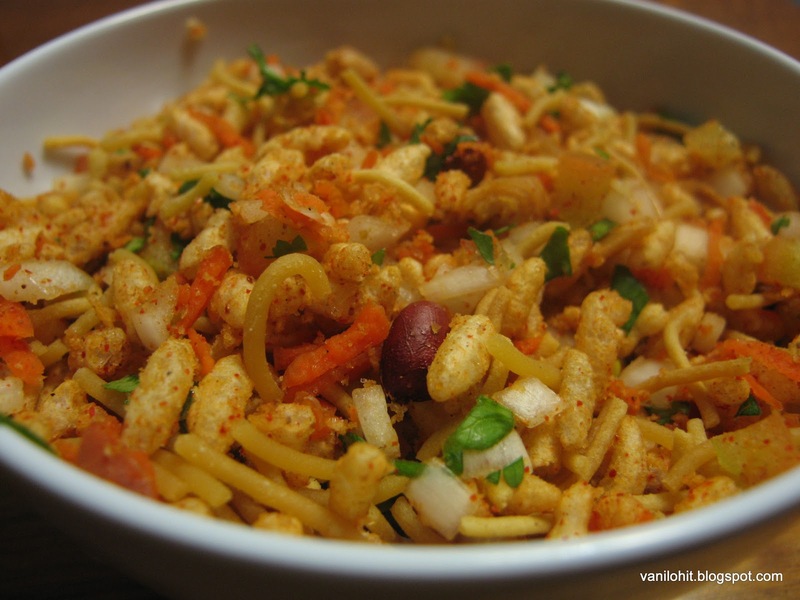 Whenever I prepare Bhel Puri at home, it resembles us the memories of chaat shop where we used to go every alternative day. There was a chaat shop near our house and we used to have some junk food while returning from office. We were well known to him, and he used to give us the parcel quickly even when there is a long queue! We both were the fans of Bhel Puri which he used to prepare. After shifting from that area, we tasted Bhel Puri at so many places, but didn't find that taste anywhere else. Keep the puffed rice under the sun for an hour or heat them on a heavy bottom pan for couple of minutes to make them crispy. Chop the tomato, onion and coriander leaves finely. Grate the carrot. Don't keep them chopped for longer time. Transfer the puffed rice onto the mixing bowl; press them with palms and crush it little-bit. Add salt, chilli powder, chaat masala, grated carrot, chopped onion, tomato and coriander leaves and mix it well. Check and adjust the taste. Finally, add the groundnuts and crushed Papri and mix it thoroughly. Transfer the Bhel Puri into the serving bowl and decorate with generous amount of sev. Usually, I will keep preparing different kind of cakes at home. But we used to ate them without any decoration or icing. 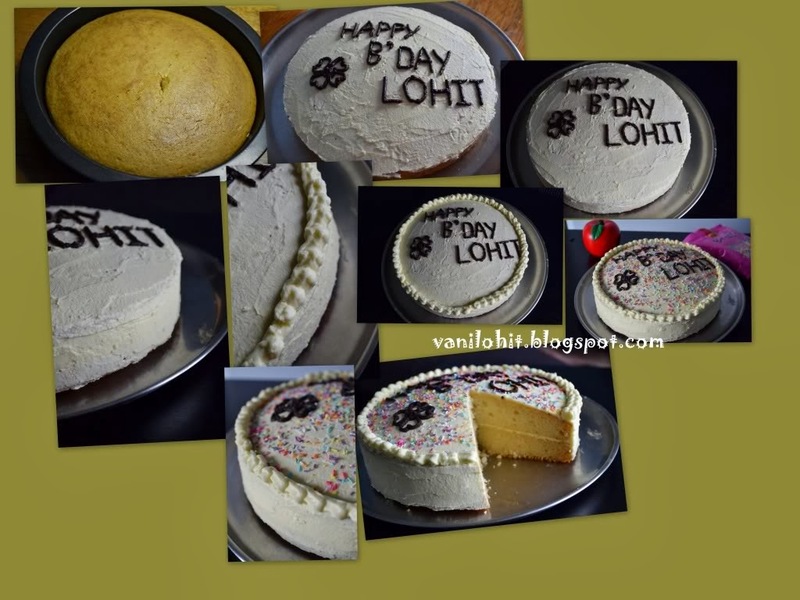 Last month was my dear hubby's birthday and I gave him a pleasant surprise with home made cake with all the decorations :) Already this cake recipe is there in so many blogs; I really don't know whose recipe is this..but my sincere thanks to the one who found this delicious cake recipe! Combine sugar and curd in a mixing bowl. Mix it nicely till sugar is completely dissolved. Make the sugar into fine powder to ease the process. Then, add baking powder and cooking soda and mix it slowly. Leave it for 2 - 3 minutes. By that time, bubbles will form and the quantity will increase. Preheat the oven to 200°C /400°F. Grease the baking pan and keep it ready. Sieve the all purpose flour 2 - 3 times. Add oil, salt and vanilla essence to the curd mixture and mix it slowly. Add all purpose flour little by little and prepare the batter. Consistency of the batter will be the same as regular dosa batter. Pour the batter onto the greased baking pan and cook it for 10 minutes in preheated oven. Now, reduce the temperature to 180°C /350°F and cook it for 35 - 40 minutes. For me, it took exactly 35 minutes to cook. Prepare 2 cakes like this. By the time cake gets cooked, prepare and keep the Icing ready. Make sugar into very fine powder using mixer. Beat the butter till it becomes fluffy and creamy. Add sugar slowly and beat it like a cream. Add corn flour and continue beating till it gets mixed well. Make sure that cake is fully cool before applying the icing. Otherwise, icing will start melting. 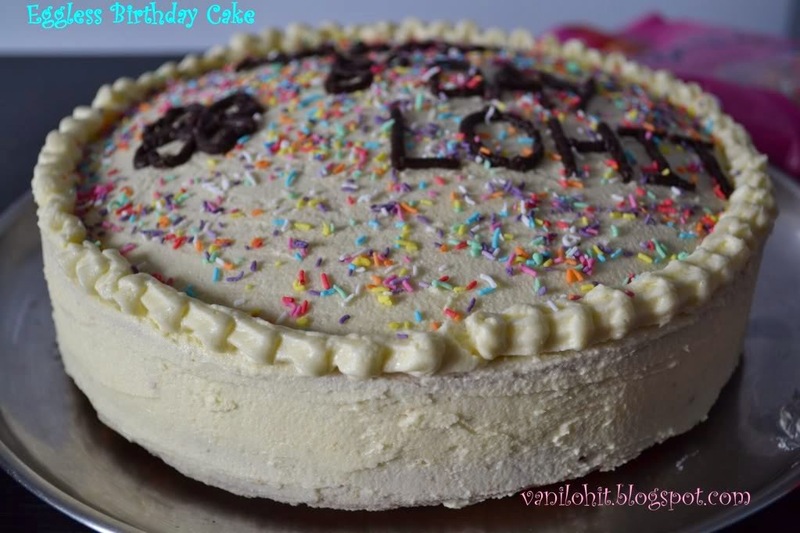 Before the second cake gets cooked, you can finish off the icing (writing the name, etc.) on the top of first cake. I have mixed little cocoa powder with 2 tbsp of icing mix for writing the name. Once the second cake is completely cool, apply one layer of icing on the top of it. 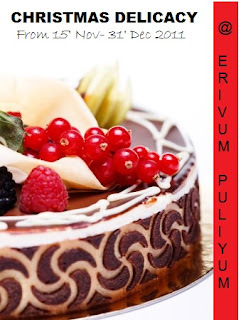 Now, place the first cake carefully on the top of second cake so that icing comes in the middle. 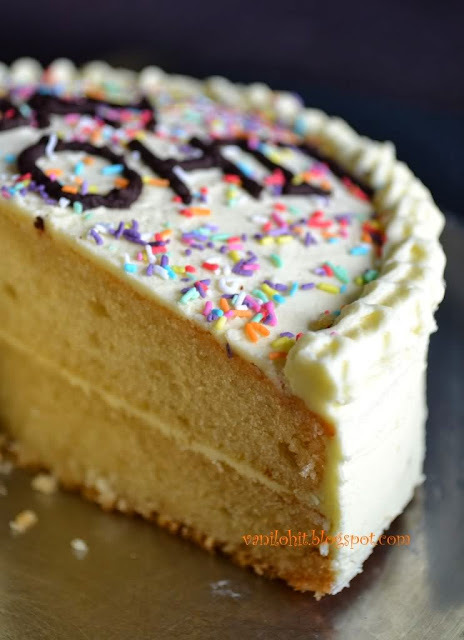 Cover the sides of the cake with icing using a knife. For decoration, I have used the cone prepared with baking paper. Instead, you can use the store bought Icing bag. Decorate the cake according to your liking. I have sprinkled some small piping on the top of the cake to give an attractive look. Keep the cake in refrigerator for at-least half an hour to get set well.